PHILADELPHIA - In your dreams, you are Neil Cornrich today. You are Dana Stubblefield's agent, and you just saw your client take possession of Monday Night Football, grab Dan and Al and Frank by the microphones and not let them go. 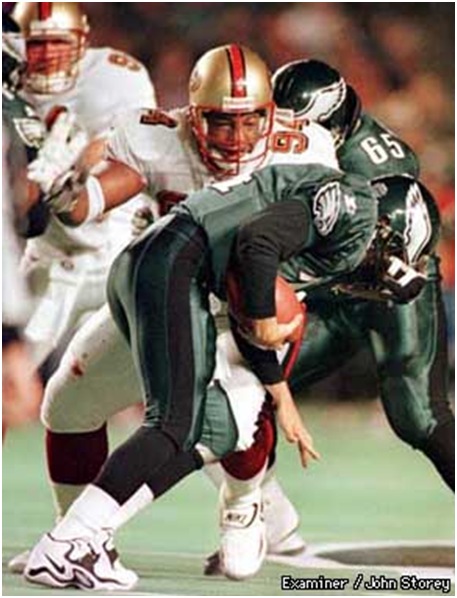 In your nightmares, you are Bubba Miller, the Eagles' left guard, and you're still seeing Stubblefield in triplicate. He's on your left side, now your right, now behind you. He's swimming through you with at least six arms. You switch back to the Cornrich fantasy. First, though, you consider casting yourself as Stubblefield. After all, what could be more fun than recording 3-1/4 sacks on national television? The 49ers' defensive tackle practically danced off the field at Veterans Stadium, singing along with the music over the loudspeakers. "She's a brick house," the speakers screamed. "She's mighty, mighty," Stubblefield mouthed, pumping his gold helmet in the air as he entered the tunnel to the locker room. But you saw his legs at the end of the 49ers' 24-12 win over Philadelphia. Large drops of blood stained the right side of his uniform pants, and a bag of ice had to be strapped to his left knee. On the whole, you'd rather be the agent, the unbruised beneficiary of Stubblefield's labors. Carmen Policy might find you exasperating, but he probably won't end a day of negotiations by throwing himself at the back of your knees. That appeared to be the way Miller concluded his encounter with Stubblefield on Monday night. The big defensive tackle had to limp off the field and tend to the soreness behind his left knee. But this was young Bubba's first NFL start, which might explain why Stubblefield didn't lash out afterwards. "I think it was an illegal (block)," he said calmly, almost pensively, confident that his knee would heal quickly. "I know I didn't see him coming at me." He said he had received an apology after the game from Miller. Stubblefield accepted, perhaps realizing that Miller couldn't possibly have meant him harm and then actually achieved it. The Eagles tried to help Miller with a double-team, bringing over center Steve Everitt. Stubblefield simply wrestled with both of them, then reached over their heads to bat down passes as if he were a volleyball player spiking over a net made of flesh and green nylon. His 3-1/4 sacks put him in first place in the NFL with 12-1/4 for the season. This is the best total of his five-year career, coming at the best possible time - for him, for the Niners, and for Cornrich. Stubblefield, to his credit, concedes that his contract status has influenced his performance. "There's no doubt, that's a little motivation, too," he said. "And the way I played last year, that was a lot of motivation." He spat out statistics, disgusted. "One sack, 30 tackles," he said, shaking his head. At that rate, his current salary of $2.25 million would seem extravagant. In the offseason, he sought out Richard Marks, once an elite shotputter, now a weight-lifting trainer. Stubblefield always had faith in his lower body, in thighs that could pass for redwood trunks. But his upper body needed refinement. He came into training camp about 20 pounds heavier, yet firmer, fast as ever. Still, he was the secondary defensive tackle on his own team, Bryant Young's beefy sidekick. The 49ers signed Young to a $26 million, six-year contract extension. Stubblefield, the story goes, became springtime trade bait. The Eagles had a chance at him, but head coach Ray Rhodes was reportedly reluctant to follow up. Based on his two years as Stubblefield's defensive coordinator in San Francisco, he didn't think the tackle's work ethic merited a big trade. Apparently, he was unaware of the training sessions with Marks. Today, he is aware, painfully so. What Stubblefield revealed Monday was not so much an ability to manhandle novice linemen as a mastery of crucial moments. "Monday Night Football" is a stage, and he danced on it. Bryant Young wore street clothes to the game, as he has for three weeks. In his absence, the sidekick had to become the star. He did. He has had 7-1/4 sacks since Young was injured in the Atlanta game, a gruesome outing for the Niners. Stubblefield had two sacks in that game, too. "Dana Stubblefield is amazing," Gary Plummer said. "Here's a guy they tried to trade, and talk about making a statement. That's a statement with about 10 exclamation points." Policy, in the visitor locker room after the game, grinned slyly when asked about Stubblefield's contractual future. It was his turn to dream. "We try not to relate that to great performances on "Monday Night Football' and with getting to 9-1," he said, building to his punchline. "And we hope they (Stubblefield and agent) feel exactly the same way."